Jantar Mantar is a scientific renowned place in Jaipur and it symbolizes the great history and brilliance of Maharaja Sawai Jai Singh II. Here you will be admired with many astronomical stone-made devices to the study space and astronomy. Maharaja Jai Singh’s curiosity and interest over Physics and Mathematics led to this historical scientific attraction. We know that Maharajas Express is known for its unique itinerary packages which lead to India’s famous historic places. In the same way, when Maharajas Express reaches Jaipur you can plan a trip to Jantar Mantar in Jaipur. Let’s know about the complete tourist attractions of Jantar Mantar through Maharajas Express. This historic astronomical observatory was built by Maharaja Sawai Jai Singh IIonce he was ordered by Emperor Muhammad Shah to rectify the astronomical calculations. Maharaja Sawai Jai Singh IIis a great scholar in Physics, Mathematics, and astronomy and he gathered all the data related to astronomy from European and Persian nations. And then this huge science observatory was established. Totally, he established five observatories in Delhi, Jaipur, Mathura, Ujjain, and Varanasi. The observatory in Jaipur is the largest one and still today it stands with all instruments but the remaining observatories are almost ruined. These stone-made astronomical instruments are helpful to calculate accurate time and position of planetary bodies etc. Attractions in Jantar Mantar is the stone-made instruments which are meant for astronomical practices. Totally, there are 19 instruments to the study astronomical details, study of space, position of celestial bodies, and accurate time etc. If you want to know about the complete details of the instruments means, hire a local guide. Vrihat Smarat Yantra is the huge and the largest sundial in Jantar Mantar to calculate the time to the precision of 2 seconds. This sundial located at the center of Jantar Mantar with an imposing height of 27mts long and is also known as world’s tallest sundial. Most importantly never miss this instrument when you visited Jantar Mantar. Ram Yantra instrument is used to measure the elevation of Sun and the planets. The instrument appears with a pair of tube-shaped structures and each structure has a pole at the center with equal height. Inside the walls of these structures, scales of altitude and azimuth of extra-terrestrial bodies can be found. This instrument is known as a small instrument resemble Vrihant Smarat Yantra and this one also calculates accurate time with a precision of 20 seconds. Jaipur accurate time will be easily calculated by this instrument from the position of ramp’s shadow. The Chakra Yantra is meant for calculation of hour angle and coordinates of the Sun. This instrument is in a ring shape and consists of four semi-circular arcs when the shadow from the sundial projects on the instrument it will calculate the declination of the Sun. In a day, it calculates the declination of the Sun for four times. 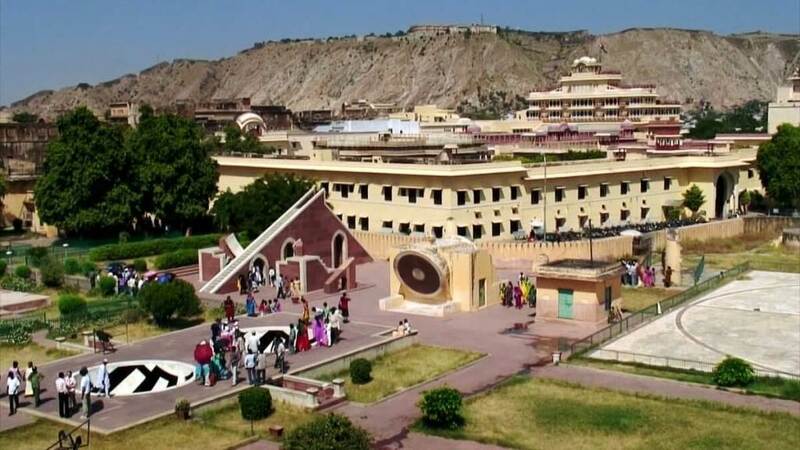 Jaya Prakash Yantra is also one of the major instruments of Jantar Mantar and it calculates the hour angles, position, azimuth, and elevation of heavenly bodies. This instrument was constructed in a shape of two hemispherical bowls like sundials. Then the reversed image of the sky falls on this instrument marble slabs and it will calculate the movements of the heavenly bodies. This instrument is used to calculate the hemisphere of the Earth. Nadivalaya is designed with a pair of two circular plates inclined in a position of North and South facing. Then the instrument will be parallel to the Earth’s equatorial plane. And some other few instruments like Digamasa, which is helpful to predict the sunset and sunrise timings and Karnti Vritya, to calculate the solar sign of the Sun. Get to know more about the Maharajas Express train fares and the many instruments in Jantar Mantar are notable for a different task to study astronomical elements.